Skype has just announced the release of Skype for Android, a client for mobile handsets, built for smartphones running Android OS version 2.1 or above. 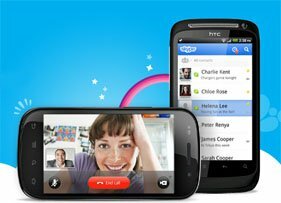 Skype said that the application has been tested successfully by the company on HTC Desire, HTC Legend, Google Nexus One, Motorola Milestone XT720, and Motorola Milestone. It may work on other Android phones, but the company can’t guarantee full functionality or compatibility. In the US, Skype for Android calling works over WiFi only. Outside the US the app works over WiFi or mobile data connection (GPRS, EDGE, 3G). It is not available in China and Japan at this moment. The application is downloadable for free from the Android Market and supports the following languages: Brazilian Portuguese, Danish, Dutch, English, Estonian, Finnish, French, German, Italian, Japanese, Korean, Spanish, Swedish, Polish, Russian, Simplified Chinese & Traditional Chinese. Mark Douglas, Product Manager of Android said: "The Skype experience is ubiquitous today. More and more people are using Skype to do things together when apart. With the addition of Android, we are pleased that Skype is now available on three of the most popular mobile platforms today: Android, iOS and Symbian"